Highly durable outdoor tables are a great way to enhance facility aesthetics and provide the opportunity	to exceed guest expectations. The convenient walk through table design ensures easy user access when entering and exiting the bench seats. This 46" square picnic table is constructed with commercial grade steel, featuring a powder-coated 1-5/8"O.D. tube frame reinforced with 1"O.D. cross-brace. The classic style perforated steel seats and table tops are strong, economical and finished with a durable, weather resistant, UV stabilized thermoplastic finish. 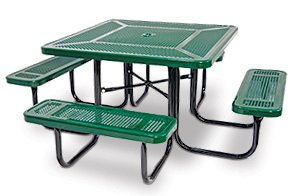 This square perforated steel picnic table is standard made with a 1-9/16"I.D. umbrella hole—umbrellas sold separately. ADA accessible models are available.